Our Engagement Rings and Wedding Bands are all custom made by Rosie Odette in our Hatton Garden workshop. We believe that your rings are for life and take great care helping you design the perfect wedding rings, carefully selecting the best precious gemstones that symbolise your love and that truly speak to you. We love making engagement rings with Ruby, Emerald, Sapphire and Diamonds as well as semi precious gemstones, Champagne diamonds, Grey Diamonds, Salt and Pepper Diamonds and Coloured Diamonds. Many of our clients come to us for something truly unique as seen in our gallery below. Please contact us: rosie@rosieodette.com for a free consultation to discuss your dream bespoke wedding bands and engagement ring. Two beautiful hand crafted wedding bands. Ruby is a gemstone well known for love. We hand carved their initials on each side of the ruby inside the bands, joining them in unison. Finished with Victorian style hand carved engraving for Her. Hand carved from wax and cast in 18 carat yellow gold, this pink tourmaline and champagne diamond enegagement ring is just exquisite. Sixteen glistening champagne diamonds surround this beautiful deep pink, pear shape tourmaline. A very unusual and stand out engagement ring inspired by Rajasthan design. Stunning, fourteen carat pink star ruby sourced on our treasure hunt in the Pink City, Jaipur. Star rubies are very powerful gemstones and were once worn by knights on battlefields to protect them from there foe. A historically rich and unique gem, which holds a unique six ray star that shimmers in natural day light. The ‘Odette’. A truly beautiful, antique style engagement ring. These stunning gemstones are personally sourced from the Pink City, Jaipur, making this ring a limited edition of three. 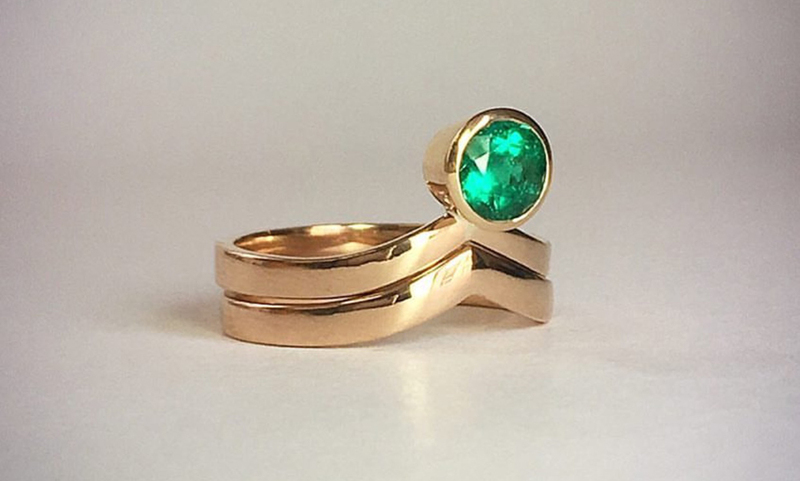 Ruby symbolises love and emerald symbolises love, honesty and integrity. Bold and beautiful. 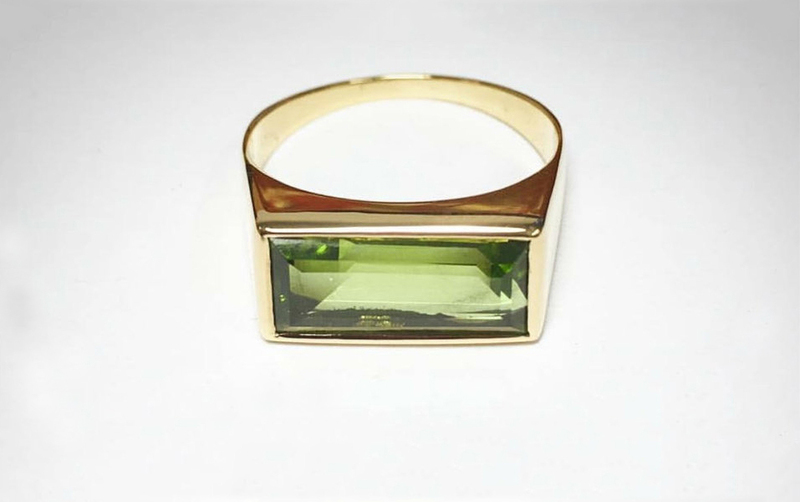 One of our favourite designs from our Regal Collection, The Peridot Empress. An engagement ring for a woman who knows her own mind. His and Hers matching bands. We love this mat finish texture for Him, and polished finished for Her. This dreamy engagement ring is set with a very sparkly Si 40 point white diamond and twelve glistening white diamonds in a surrounding halo. Stylish and understated wedding band. Simple is always best. We love this combination of precious gemstones. Inspired by the cosmos, gazing up at the sky searching for shooting stars. Magical. “Such a beautiful surprise. My boyfriend of 5 years finally put a ring on it. I think he knew that any old shop bought ring just wouldn’t do, and knew of Rosie through a mutual friend. He told me they met up several times over coffee to help plan what he wanted for me. I love him dearly, but he’s not the most creative of people and he said how amazing Rosie was at understanding what he was trying to create. Inspired from our Healing Queen Ring from Regal Collection, this very stylish and unique engagement ring is set with a mesmerising, brilliant cut Zambian emerald, stacked with matching V-shaped band. Queen Cleopatra was so obsessed with this mystical green gem, emerald mines were named after her. Our ‘Cleopatra’ Snake Ring from Regal Collection is hand carved in wax and cast in gold. 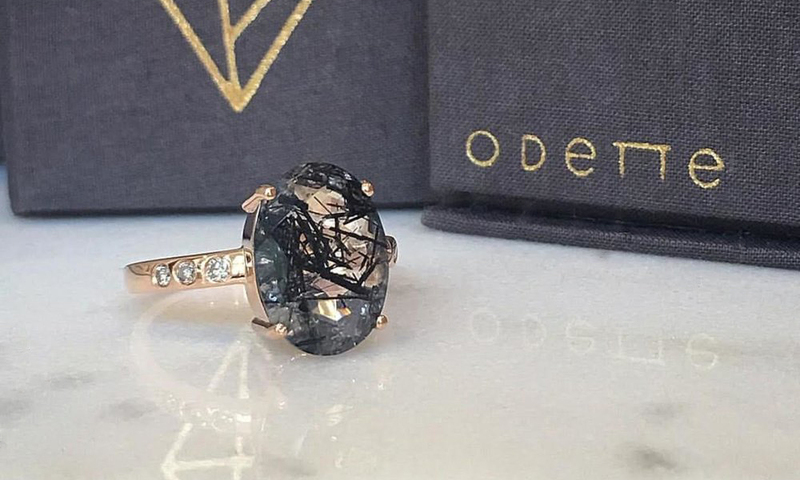 A very cool and contemporary engagement ring. Snakes are a Victorian symbol of eternal love. Diamonds in Greek is ‘Adamas’ which translates as ‘Invincible’ and emerald is known as a stone of love, honesty and integrity. Wonderful qualities for marriage. One of our favourite ‘up-cycle’ and redesigns. This very pretty and unusual design was originally ‘Pip’s Grandmother’s engagement ring. We transformed a once classic, Edwardian style engagement ring into an organic, contemporary design that ‘Pip’ felt truly spoke to her today. Carrying a piece of her Grandmother’s heart and gemstones through more generations to come. Stunning and timeless ‘Her’s & Her’s’ engagement rings. Hand carved from wax and cast in yellow and rose gold gold. Set with grey and champagne diamonds, for that unique, vintage style sparkle. 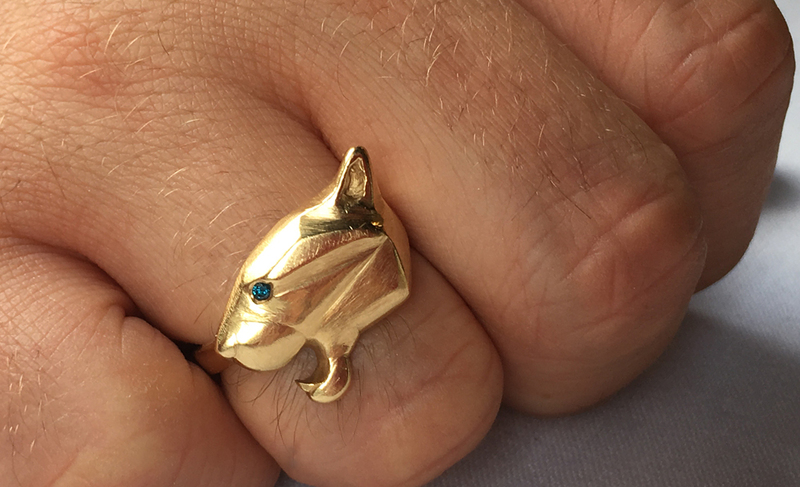 Truly alternative Engagement jewellery for Him. Hand carved from wax and cast in white gold. The grey and blue diamonds, symbolise the cosmos, subtly displaying the constellation of ‘Leo’ in sparkling blue diamonds, as if they are stars in the sky.